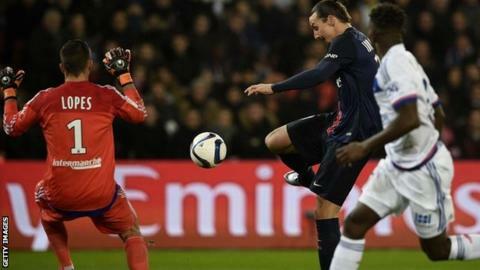 Paris St-Germain went 17 points clear at the top of Ligue 1 with a comprehensive victory over Lyon. Zlatan Ibrahimovic, now the league's top scorer with 14 goals, opened the scoring from Thiago Silva's long ball and added a late penalty. Serge Aurier had doubled PSG's lead before Jordan Ferri gave Lyon hope with an effort fumbled in by Kevin Trapp. Edinson Cavani hooked in their third and, after Ibrahimovic's penalty, Lucas added a fifth from a counter-attack. Laurent Blanc's side, who are chasing their fourth consecutive title, are unbeaten in their first 18 league games. No side has ever finished a Ligue 1 season without defeat. Match ends, Paris Saint-Germain 5, Lyon 1. Second Half ends, Paris Saint-Germain 5, Lyon 1. Foul by Zlatan Ibrahimovic (Paris Saint-Germain). Mapou Yanga-Mbiwa (Lyon) wins a free kick in the attacking half. Goal! Paris Saint-Germain 5, Lyon 1. Lucas Moura (Paris Saint-Germain) right footed shot from the centre of the box to the high centre of the goal. Assisted by Ángel Di María following a fast break. Corner, Lyon. Conceded by Kevin Trapp. Attempt saved. Claudio Beauvue (Lyon) right footed shot from outside the box is saved in the bottom left corner. Assisted by Steed Malbranque. Attempt missed. Corentin Tolisso (Lyon) right footed shot from outside the box misses to the left. Offside, Paris Saint-Germain. Marquinhos tries a through ball, but Lucas Moura is caught offside. Substitution, Lyon. Steed Malbranque replaces Jordan Ferri. Substitution, Paris Saint-Germain. Marquinhos replaces Thiago Motta. David Luiz (Paris Saint-Germain) wins a free kick in the defensive half. Foul by Claudio Beauvue (Lyon). Attempt missed. Edinson Cavani (Paris Saint-Germain) right footed shot from outside the box is high and wide to the right. Assisted by Ángel Di María. Substitution, Lyon. Rachid Ghezzal replaces Maxwell Cornet. Substitution, Paris Saint-Germain. Lucas Moura replaces Blaise Matuidi. Attempt missed. Sergi Darder (Lyon) right footed shot from outside the box is high and wide to the right. Goal! Paris Saint-Germain 4, Lyon 1. Zlatan Ibrahimovic (Paris Saint-Germain) converts the penalty with a right footed shot to the bottom left corner. Penalty Paris Saint-Germain. Zlatan Ibrahimovic draws a foul in the penalty area. Penalty conceded by Henri Bedimo (Lyon) after a foul in the penalty area. Delay in match Corentin Tolisso (Lyon) because of an injury. Attempt saved. David Luiz (Paris Saint-Germain) right footed shot from outside the box is saved in the bottom left corner. Blaise Matuidi (Paris Saint-Germain) wins a free kick in the attacking half. Foul by Jordan Ferri (Lyon). Substitution, Lyon. Sergi Darder replaces Clément Grenier. Corner, Paris Saint-Germain. Conceded by Clément Grenier. Substitution, Paris Saint-Germain. Marco Verratti replaces Adrien Rabiot. Foul by Blaise Matuidi (Paris Saint-Germain). Maxime Gonalons (Lyon) wins a free kick in the attacking half. Offside, Lyon. Corentin Tolisso tries a through ball, but Maxwell Cornet is caught offside. Attempt missed. Corentin Tolisso (Lyon) left footed shot from outside the box misses to the right. Hand ball by Jordan Ferri (Lyon). Attempt missed. Claudio Beauvue (Lyon) left footed shot from outside the box misses to the left. Assisted by Rafael. Goal! Paris Saint-Germain 3, Lyon 1. Edinson Cavani (Paris Saint-Germain) left footed shot from the centre of the box to the bottom right corner. Assisted by Ángel Di María with a cross. Thiago Motta (Paris Saint-Germain) is shown the yellow card for a bad foul. Foul by Thiago Motta (Paris Saint-Germain). Corentin Tolisso (Lyon) wins a free kick in the attacking half. Attempt missed. David Luiz (Paris Saint-Germain) header from the right side of the six yard box misses to the right. Assisted by Ángel Di María with a cross following a corner. Corner, Paris Saint-Germain. Conceded by Mapou Yanga-Mbiwa.